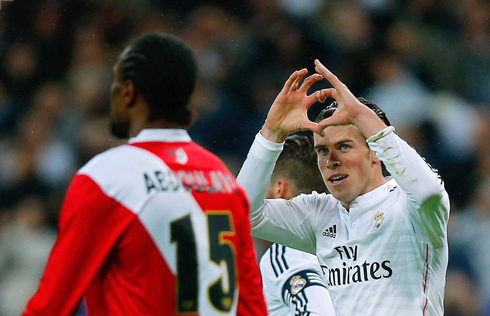 ﻿ Real Madrid 5-1 Rayo Vallecano. A well-oiled machine! 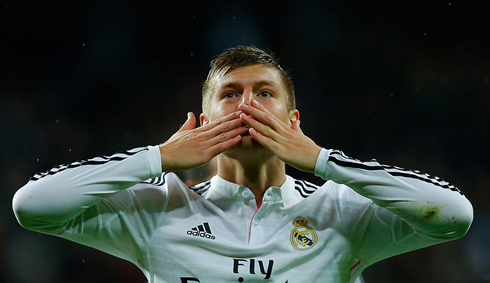 08.11.2014 » Real Madrid 5-1 Rayo Vallecano. A well-oiled machine! Real Madrid have gone through another obstacle in La Liga, after running over Rayo Vallecano tonight at the Santiago Bernabéu, with a 5-1 scoreline. The hosts' goals were delivered by Gareth Bale, Sergio Ramos, Toni Kroos, Karim Benzema and lastly, Cristiano Ronaldo. In what was an open first half, Real Madrid got off to a quick start after an intricate move involving Cristiano Ronaldo, Toni Kroos and Bale put Rayo behind after a mere nine minutes. Bale's sliding finish after Kroos' excellent center, likely calmed his nerves in his first game back. But as always, Paco Jemez's men wouldn't sit back, at time dominating possession and forcing Real to play on the counter, an almost incredulous idea but for fans of Rayo, nothing surprising considering their penchant for vibrant, free flowing football. For a fifteen-minute spell in the first half, they peppered Navas with shots, ensuring that the Costa Rican knew their intent. Still, Madrid looked great on the break. Played through at the half-line from Karim Benzema, Cristiano Ronaldo found himself free on goal before being seemingly brought down by Mohammad Fatau, yet the referee waved it off as Ronaldo angrily gesticulated in response. Karim Benzema would hit the crossbar from a Toni Kroos corner in the 39th minute, but another corner just a few minutes later and this time taken by James Rodriguez, would result in a goal off the knee of Sergio Ramos. It may have been a lucky strike though, as an earlier deflection took the ball on a different pass. 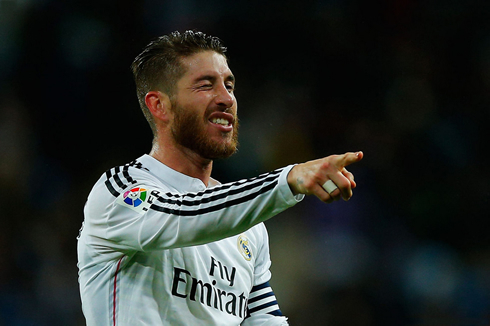 However and with scoreline changing to 2-0, Real Madrid weren't certainly complaining. All seemed to be going well, until a moment of madness from James Rodríguez right before the half-time break. A negligent back pass, which already ill-advised, was also far too soft, gifted the ball straight to Leo Baptistao and the man on loan from Atletico Madrid squared it to an open Alberto Bueno, who then slotted it home while Navas and Pepe bundled over each other trying to recover. At the break the scoreline was at 2-1 for the hosts, which was perhaps a deserved result considering Rayo's good work in attack, even though they only capitalized their best chance thanks to a a disastrous lapse of concentration from the Colombian number 10. The second half started like the first one ended, with Rayo continuing their impressive play. Early in the second half, they may have been level, as Leo Baptistao buried his one on one chance against Keylor Navas, just before being called back for offside. Replays showed it was marginal at best... Almost immediately, Madrid responded through Toni Kroos, who would net his first goal in a white shirt after a Cristiano Ronaldo dribble-layoff. An exquisite shot from outside the box, in which the ball seemed to hover just above the grass the entire way, curling brilliantly into the bottom corner. That provided the impetus for Madrid to open the floodgates. Merely four minutes later, Ronaldo would again set up a goal, this time for Karim Benzema, a simple tap in from the six-yard box. However, the replay would show it was definitely offside, at least far more so than Baptistao's earlier chance. A frustrated Ronaldo, who struggled with his decision making throughout the whole game, would finally get on the score sheet in a couple minutes from time and after a goalkeeping error. The Portuguese forward now has goals in his last 19 league games, continuing his impressive form, though judging by his celebration he wasn't remotely happy with his performance. But if the number of goals that the Merengues are conceding is in fact one of the biggest problems that Ancelotti has in hands these days, then it's surely also a sign that things are going well, since Madrid's machine keeps firing on all cylinders even when they are challenged. Cristiano Ronaldo next game will be for the Portuguese National Team in a qualifier for the EURO 2016 against Armenia, scheduled for next Friday, the 14th of November. You can watch Juventus live stream, Portugal vs Armenia, Valencia vs Athletic Bilbao, Tottenham vs Stoke City, Swansea vs Arsenal, and Borussia Dortmund vs Borussia Monchengladbach, all matches provided from our live streaming game pages.